Each station along the Bernina Pass has been captured exquisitely, right down to the building features and associated clutter (where appropriate). As is the nature of the line, some stations are very remote, and accurately have next to no landmarks at all! 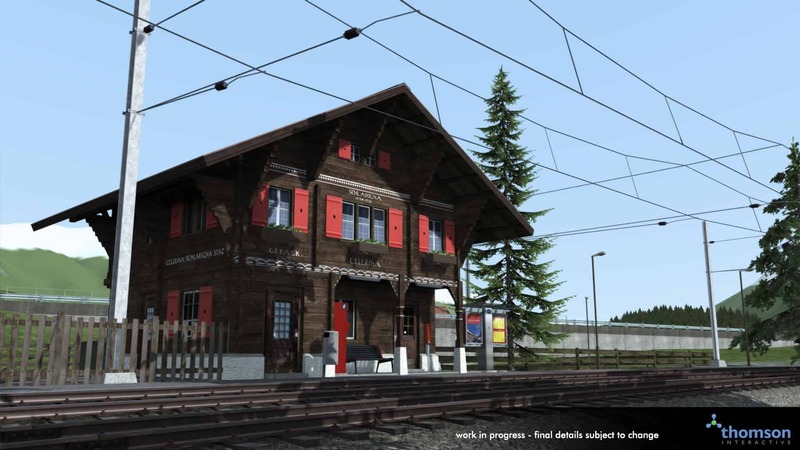 The overhead electrification is another masterpiece, not only is it detailed, but the pantographs react to its changing height at tunnels and other restricting locations. Looking further afield, and the world-heritage mountain terrain is both towering and finely crafted, complete with accurate rock-face detailing. 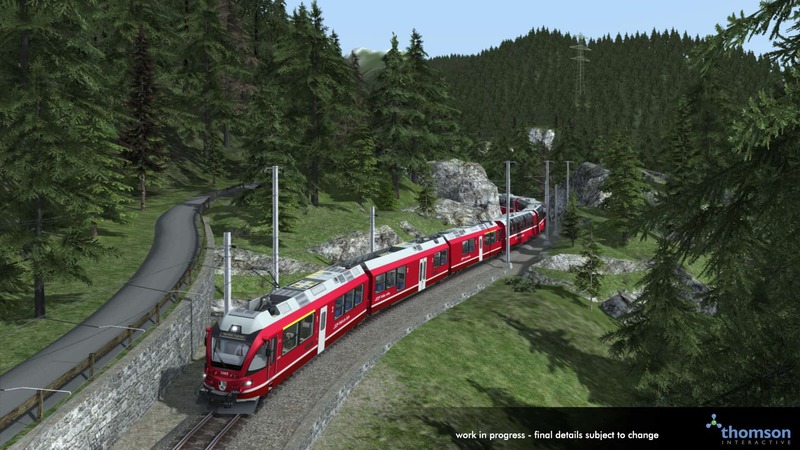 Between Privilasco and Cavaglia there are multiple hairpin curves, with 7% gradients throughout, in order to sufficiently scale the Alps – this is not only a remarkable example of mountain rail, but it is equally as captivating within Train Simulator. Another similar location is Alp Grüm, the station itself looks over the vast valley, and sits atop a winding hairpin which clings to the topography. 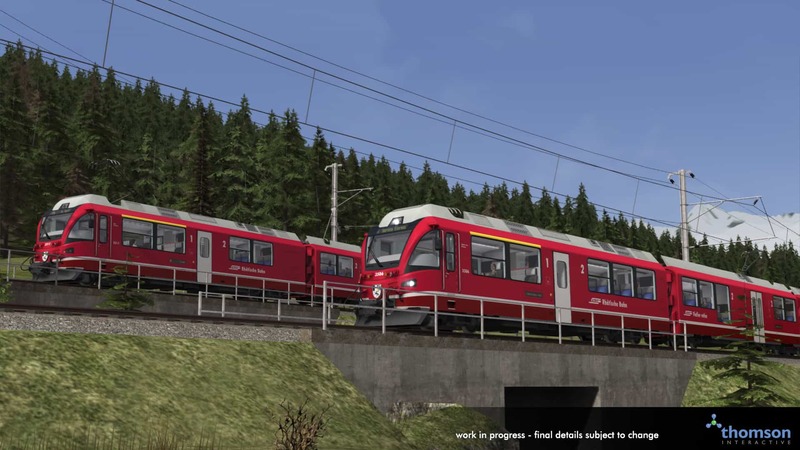 DC traction is better suited for consistent gradients than AC traction, especially when having to employ dynamic braking for extended periods of time, and so that is what the Bernina Pass is electrified at, 1000 V DC. 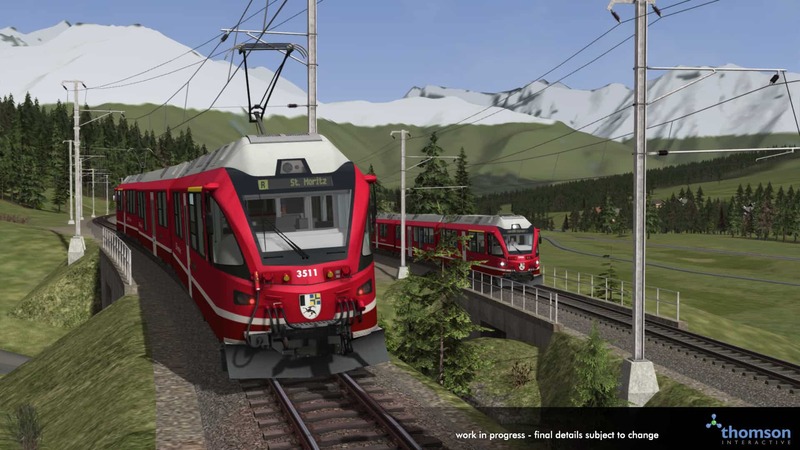 By contrast, the Albula Line, and the connecting branch between Samedan and Pontresina, are 11 kV AC electrified, and so motive power must be able to switch modes to complete uninterrupted journeys. Only a select number of stations along the route are timetabled stops, the rest are only called at by passenger request by utilising a button on-board that notifies in the cab when someone wishes to alight, or by a button on the platform that brings to life a specific request stop signal, alerting the driver on approach that someone is waiting to board. There are also some stops which don’t have the signal, so stopping must be done on-sight. 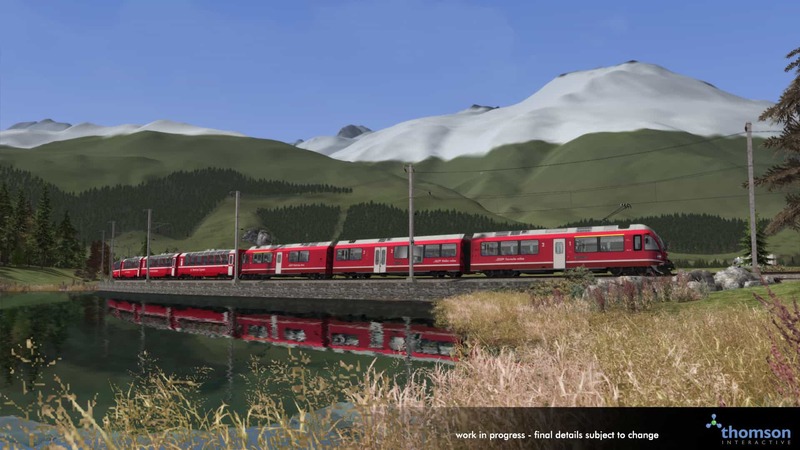 On the Bernina Pass route, this function is active and randomised. In each scenario, the request stop feature will have you calling at, or not as the case may be, the various request stops on the route at random. 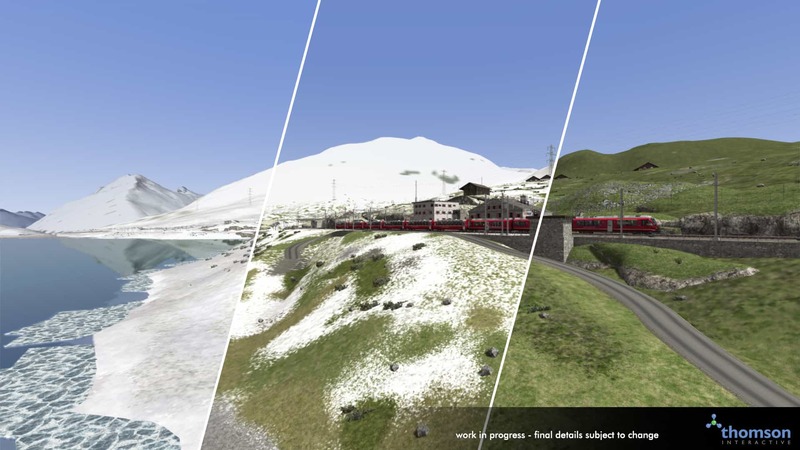 Experience the Bernina Pass from a passenger’s perspective with the Passenger Mode scenarios. 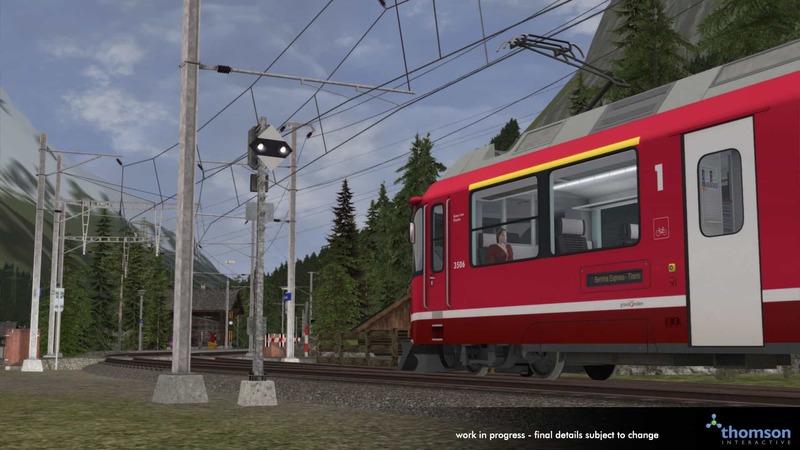 Enhanced since its last appearance in the Albula Line, Passenger Mode on the Bernina Pass is capable of station stops and other automated functions, even whistle blowing, so pick your seat and enjoy the journey. Great care has gone into the representation of seasons along the route. In Summer, the route throughout is cleared of snow, however in Spring and Autumn, the mountain tops receive a dusting, and by extension so does the track and locations at higher altitudes. In Winter however, the route sees a substantial amount of snowfall, and at its peak, snow reaches the railhead and which results in snow-clearing effects as you drive along. Other frosted features include deeply cut snow walls as cleared by snow blowers, and Lago Bianco which partially freezes over. Dual-voltage and built for mountainous routes, the RhB’s ABe 8/12 Allegra is right at home on the Bernina Pass. 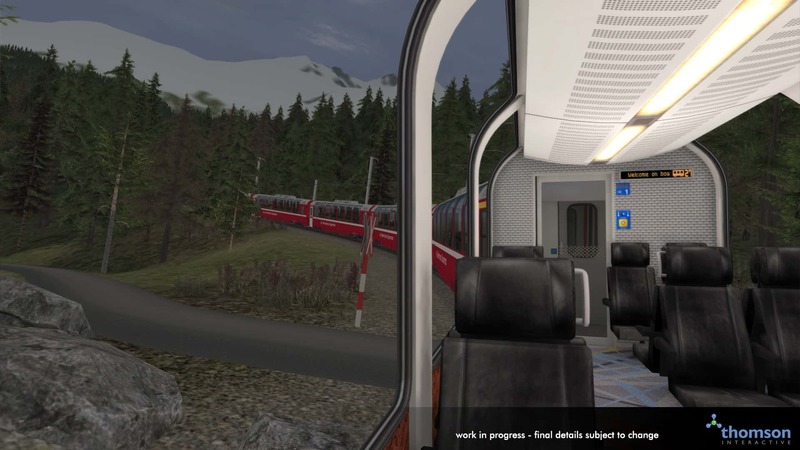 Taking control of this modern EMU, which is in fact the fastest on record metre-gauge rails, gives you some of the best views from any windscreen on the planet. 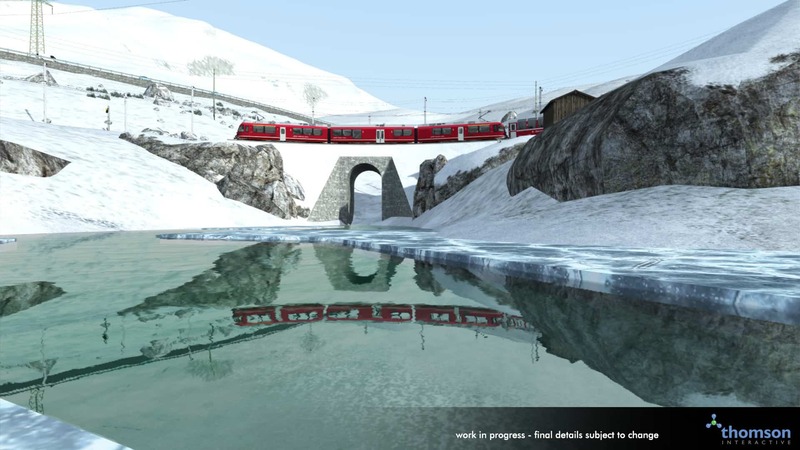 Included with the Bernina Pass will be the unique, panoramic coaches that are used on the “Bernina Express”, which traverses both the Albula and Bernina Passes to connect the likes of Chur and Davos to Italy. Four variants are included – Ap (first class), Bp (second class), Api (first class accessible toilet) and Bps (second class catering service) – with the passenger view located in first for the most premium on-board experience. It is without a doubt that Thomson Interactive have here another masterpiece in the works, the jaw-dropping gradients and exquisite details present are shaping this up to the best pinnacle Swiss experience. 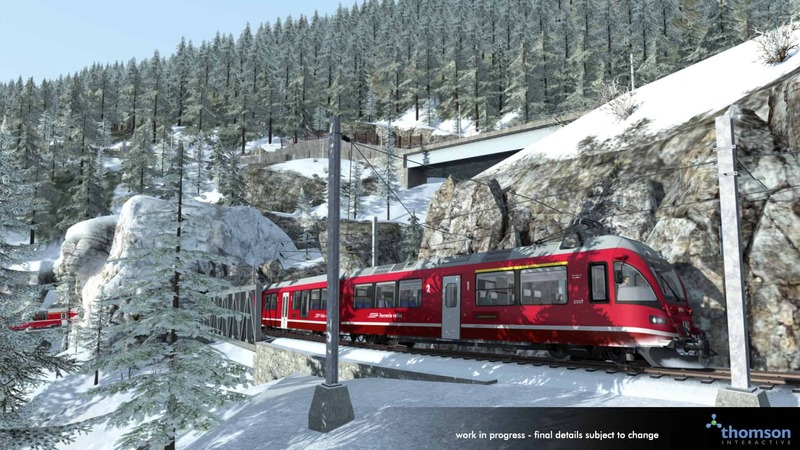 So, keep an eye out for when you will be able to climb aboard, as the Bernina Pass is coming soon Train Simulator.